Fuses are designed to fail safely before any damage is done to the wiring or devices in your car. So if your cigarette lighter fuse keeps blowing over and over again, that’s a very good indication that there is some type of underlying problem that needs to be dealt with. The problem could be in the cigarette lighter socket, in the device you’re trying to plug in, or even in the cigarette lighter wiring. The only way to fix it so that your cigarette lighter fuse stops blowing is to check each possible point of failure until you identify the issue. But whatever you do, don’t even think about replacing the cigarette lighter fuse with a higher amp fuse. Depending on the nature of your problem, replacing the fuse with a higher amp version could damage the fuse box, melt wires, or even cause a fire. How Do Cigarette Lighters Work? Car cigarette lighters are simple devices that have changed very little over the decades. The two basic components are a socket, which is connected to both power and ground, and a removable plastic or metal housing that contains a coiled metal strip. In most cases, the inner wall of the socket is grounded, and a pin at the center is connected to a fused power source. When you push the lighter into the socket, current passes through the coiled metal strip, which causes it to heat up. Both cigarette lighter sockets and dedicated 12-volt accessory sockets can be used to power 12-volt devices and power adapters. So if you have a 12-volt accessory socket on a separate circuit that keeps popping fuses, the diagnostic procedure will be about the same. Why Do Cigarette Lighter Fuses Blow? Cigarette lighter fuses, like all car fuses, blow when the circuit draws more amperage than the fuse is designed to handle. If the cigarette lighter fuse is 15 amps, then a draw of more than 15 amps will cause it to blow. If you replace it with another 15 amp fuse, and something on the circuit is still drawing more than 15 amps, then the fuse will just blow again. It may seem like the easiest solution would be to simply replace the 15 amp fuse with a larger fuse, but this is actually very dangerous. While the wiring in the cigarette lighter circuit may be capable of handling a little more than 15 amps, there’s no guarantee that it actually is. And if the problem in your circuit is actually some type of short, putting in a larger fuse may cause the wiring to heat up to the point where it could melt or even cause a fire. While you can buy a circuit breaker as a direct replacement for the fuse that keeps blowing, this is also a bad idea, especially if there is a short in the circuit. These circuit breakers are useful in some applications and have certain diagnostic uses, but using one to intentionally overload a cigarette lighter circuit is not recommended. 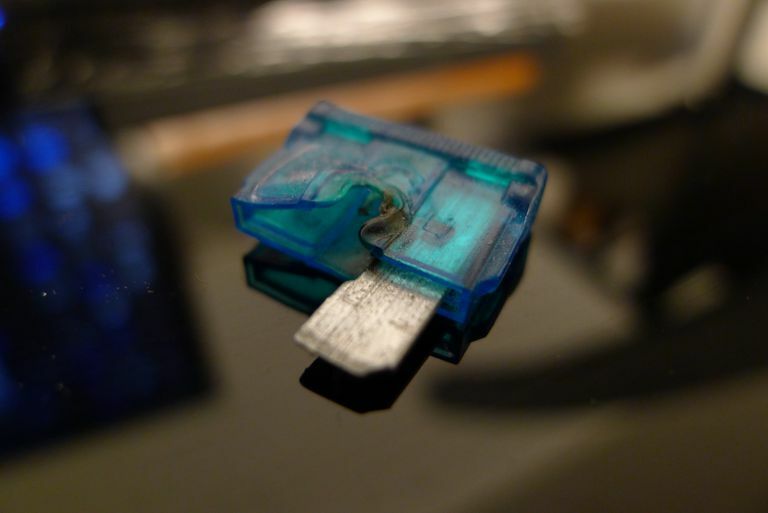 There are a lot of reasons for a cigarette lighter fuse to repeatedly pop, but one of the more common, and often overlooked, is the presence of a foreign object in the socket. Since cigarette lighter sockets are designed so that the entire body of the metal cylinder is grounded, and the center pin is hot, it’s surprisingly easy to short the circuit. Some vehicles have change holders, or catch-all trays, in the vicinity of the cigarette lighter socket, which makes it dangerously easy for a coin to fall in. If that happens, the coin may contact both the grounded barrel and the hot pin inside the socket and cause a short circuit. Other metal objects, like paperclips, or even pieces broken off from old phone chargers, can also become lodged in a cigarette lighter socket. In some cases, you may find that such an object doesn’t cause a short circuit all the time, but inserting the cigarette lighter or a 12-volt power adapter causes the fuse to blow immediately. If you look inside your cigarette lighter socket with a flashlight and see a foreign object, there’s a good chance that removing it will fix your problem. Just to be safe, you should make sure that you remove the cigarette lighter fuse before reaching inside the socket to remove the foreign object. You can then install a new fuse and check to see if it still blows. There is a hard limit on the current that you can draw from a cigarette lighter socket or any 12-volt accessory socket. If the device that you want to power up via your cigarette lighter draws more amperage, then it’s a simple fact that the fuse will blow every time you plug it in. In most cases, cigarette lighter circuits use 15 amp fuses, but you can check the fuse box in your vehicle to be sure. You’ll then want to check the device you’re trying to plug in to see how much amperage it draws. Cell phone chargers are usually designed to work with cigarette lighter sockets without blowing a fuse, but other devices, like cigarette lighter inverters, can easily overload the circuit. Even if your 12-volt device, charger, adapter, or inverter is designed to draw less than 15 amps, it’s still worth inspecting the plug. If the plug is broken, worn out, or has something stuck on it, plugging it in may cause a direct short between power and ground inside the cigarette lighter socket. If you’ve only ever tried to plug one thing into your cigarette lighter, it may even be worth trying a different 12-volt charger or adapter just to rule out a problem with the one that you have been using. Or you could also use an ohm meter to check for an internal short in your adapter. Most of the time, a cigarette lighter fuse that keeps blowing is caused by some external problem. However, it’s always possible that you could be dealing with an internal problem. If the fuse always blows without even plugging anything in, and you have verified that there isn’t a foreign object inside the socket, then there is a problem somewhere else in the circuit. In order to totally rule out a problem with the socket itself, you can remove it see if the fuse blows. This is an application where a circuit breaker fuse can actually be useful, since blowing fuses over and over again to narrow down the source of your problem could become expensive. This type of problem will also be easier to diagnose if you are able to track down a wiring diagram for your specific vehicle since that will show you any components other than the cigarette lighter that are also on the same circuit. Disconnecting each of these components in turn, if there are any, may also be useful in determining the source of your short. Another likely cause for this type of problem is a shorted out power wire. That essentially means that the power wire that connects to your cigarette lighter may have rubbed or burned through and come into contact with metal somewhere behind the dashboard. You can look for this type of short by checking for continuity between the cigarette lighter power wire and ground. Depending on your specific vehicle, it may be exceedingly difficult to actually find the location of this type of short. The short may be located in a difficult to reach a position that you won't be able to find without removing your radio, HVAC controls, or even the dashboard. While there are devices for locating shorts in automotive applications, this isn't the kind of tool everyone will have laying around. In some cases, the easiest solution may be to just leave your cigarette lighter fuse out permanently and run a new power wire to the cigarette lighter socket. If you elect to run a new power wire to the cigarette lighter socket, it’s very important to use an appropriate wire gauge. It’s also vital to install an appropriate fuse, in the event that you decide to go this route. In some cases, you may be able to use a blank spot in your fuse box, and in other cases, the only option is to run a power wire directly to the battery. In both of these situations, failing to use an appropriate fuse could easily result in an electrical fire. And in any case, running a new power wire should be your last resort after you have ruled out every other potential reason for your cigarette lighter fuse to blow repeatedly.